Patrick Chan of Canada rallied back after a disappointing Short Program to capture the gold medal. Japan's Nobunari Oda claimed the silver and the bronze went to Adam Rippon (USA). Chan, who stood in fourth place after the Short Program, nailed a quadruple toeloop, triple Axel-double toe and four more clean triples. He only fell on a triple Axel. The World silver medalist picked up 166.32 points for his program to “Phantasia” by Andrew Lloyd Webber and totaled 239.52 points to win the title. “I think after the short program it was a little tough because I wasn't sure about what I did wrong. I thought I prepared myself very well. Today I was a little hesitant, but really I didn't do anything different. I just focused a little more, maybe analyzed it (the quad toe) little less and just went with the feeling that I usually feel in practice and it went off like I usually do it in practice in Colorado Springs. When I landed it, it was pretty exhilarating”, Chan explained. Rippon's elegant routine to Piano Concerto No. 2 by Sergei Rachmaninov included a triple Axel-double toe, a triple flip-triple toe as well as four more triple jumps. The two-time World Junior Champion was awarded 155.51 points and remained in third place at 233.04 points. “I'm really happy with how I skated today. Of course I know I can skate even better. I didn't feel a hundred percent this week, but all the training I've done this summer really paid off”, Rippon, who suffers from a cold, told the post-event press conference. Kevin Reynolds (CAN) landed a quad Salchow and quad toe-triple toe combination but popped two Axels to slip to fourth at 218.65 points. KINGSTON, Ont. - Toronto's Patrick Chan is one of the world's top figure skaters, having a full command of the challenging technical elements and presenting them with grace and polish. At the Skate Canada International championship on Saturday, Chan, 19, opened his free skate routine smartly by knocking down his first-ever quadruple jump, drawing a loud roar of the crowd. The unexpected cheers, however, meant Chan couldn't hear his music for a time and fell on a triple Axel, which cancelled an attempted combination. On his next three jump elements, including a triple Lutz and a triple Axel-double toe loop combination, Chan had to be strong to save the landings. In the end, the near capacity crowd gave him a standing ovation and his routine was good enough to win the men's singles gold medal. The win was Chan's second in three years at Canada's only International Skating Union senior Grand Prix competition. After he fell three times in Friday's short program and tumbled to fourth in the standings, Chan rebounded Saturday, landing the quad, but he battled through almost every other element to win the gold medal with 239.52 points. Already the two-time defending world silver medallist, Chan feels he has upgraded himself with the quad, which he missed in the short program. 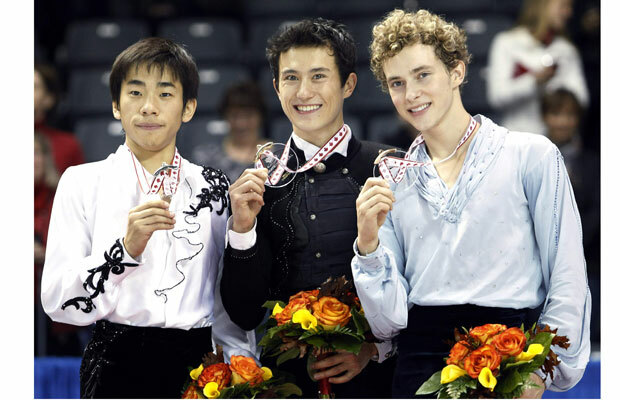 Chan's victory, which was worth $18,000 US in prize money, was the highlight of a four-medal day for the Canadian team. Late entry Kirsten Moore-Towers of Waterloo, Ont., and Dylan Moscovitch of Toronto won silver in pairs and came within 0.48 points of the gold, while Paige Lawrence of Kennedy, Sask., and Rudi Swiegers of Brandon, Man., took the bronze. Amelie Lacoste of Delson, Que., was a surprise winner of the women's singles bronze medal, climbing two places after being fifth in the short program. The final medal total for the star-depleted Canadian squad could be five, if Vanessa Crone of North York, Ont., and Paul Poirier of Unionville, Ont., can skate clean in Sunday's free dance. They were second in the short dance. The national roster for Skate Canada International was missing three key entries. Injuries forced the world champion ice dance team of Tessa Virtue of London, Ont., and Scott Moir of Ilderton, Ont., and the pairs tandem of Jessica Dube of Drummondville, Que., and Bryce Davison of Huntsville, Ont. - ranked No. 6 in the world - to withdraw. Olympic bronze medallist Joannie Rochette of Ile Dupas, Que., is still mourning the death of her mother and decided not to compete on this year's Grand Prix circuit. If Canada finishes with five medals it will match the country's second-best showing, accomplished in 2005, 2004 and 1973. The most medals won by a Canadian team is six in 1990, when Canada won all four gold medals in Lethbridge, Alta. Japan's Nobunari Oda, the leader after the short program, landed a quad on his opening element and was second in men's competition with 236.52 points, picking up $13,000. Two-time world junior champion Adam Rippon of the U.S. battled through a cold and asthma to finish third with 233.04 points and earn $9,000. Kevin Reynolds of Coquitlam, B.C., the star of the short program when on Friday he landed the first quad in ISU history in the men's singles opening program and then added a second one, executed another two quads in the free skate final, but struggled the rest of the way and was fourth at 218.65 points. Jeremy Ten of Vancouver landed seven triple jumps, including the Axel, and placed eighth at 191.86 points. Lubov Iliushechkina and Nodari Maisuradze of Russia escaped with gold in pairs with 171.40 points, while Moore-Towers and Moscovitch skated a dynamic program to finish with the silver, scoring 170.92 points for the best showing in their second year together. Moore-Towers, 18, and Moscovitch, 26, were named substitutes for Dube and Davison early last week, and took full advantage of the opportunity by winning the free skate final, after placing fifth in the short program. Lawrence, 20, and Swiegers, 23, were third straight across the board, including the free skate final and their overall result. They took the bronze with 161.15 points. Meagan Duhamel of Lively, Ont., and Eric Radford of Balmerton, Ont., were fifth with 158.53 points. Lacoste took the bronze with 172.37 points for her first international medal. Cynthia Phaneuf of Contrecoeur, Que., who scored 156.24 points, landed only two triple jumps, fell on two triple Lutzs, and turned two other triples into a single and a double. After landing her opening triple-double-double toe loop combination, she fell apart, telling her coach Annie Barabe immediately after her skate she gave up after missing a triple Lutz and losing focus. Alissa Czisny of the U.S. won her second Skate Canada International title and her fourth career medal (bronze in 2008, silver in 2009) with 172.37 points. She also won in 2005. Ksenia Makarova of Russia was second at 165.00 points. Myriane Samson of St. Jean sur Richelieu, Que., was seventh at 152.05 points.